Having horses in our lives is a both a privilege and a responsibility. Properly meeting their needs requires much time, money, effort, knowledge and skills. There is quite a bit of information available nowadays to assist people with properly caring for, and interacting with, their horses. However, there are four crucial aspects of having the best interactions possible with our horses, as well as keeping them as happy, healthy and sound as possible, that are not often addressed. The first is the ability to know what your horse is communicating to you in every moment regarding what she is feeling, as well as the skills necessary to properly respond to what she is communicating (please see my last article entitled, “The Power of Knowing How to Read the Horse“). The second is to have an understanding of Unnecessary Tension, what it is, what causes it and the negative effects that it has on both the mind and body, which is what I will address in this article. I have filled many pages with this topic, but I will try to keep this article as concise an overview as possible. The third is to have knowledge of the benefits of assisting the horse in releasing Unnecessary Tension and replacing it with Total Relaxation. This will be the subject of my next article. The fourth is having knowledge and awareness of Proper Skeletal Alignment, what the negative effects of Improper Skeletal Alignment are, as well as having the skills to assist the horse in attaining and maintaining Proper Skeletal Alignment. This will be the subject of my last article in this series. The easiest way to understand what Unnecessary Tension is, is to first have an understanding of what Necessary Tension is. Both of them are tension, but one is necessary and positive, and the other is unnecessary and negative. Necessary Tension in the mind is a life saving reaction to a true and real threat. This tension in the mind signals the body to prepare for fight or flight by tensing the muscles and releasing adrenaline and cortisol. Necessary Tension in the body is the amount of tension required for a muscle to do its job. All other tension is Unnecessary Tension. Tension in the mind is created by fear, confusion, anger, pain, discomfort, etc. These negative emotions and feelings are caused by something outside of the horse known as a Stressor. A Stressor is a tangible thing. Since these negative emotions and feelings are in response to a Stressor, this is called a Stress Reaction. Stress Reactions fall under the category of survival instincts. While the Stressor itself is tangible thing, a Stress Reaction is not a tangible thing. It only exists in the mind. It is the mental/emotional reaction to a perceived Stressor. The purpose of a Stress Reaction is to prepare the body of the horse for fight or flight by creating tension in the mind. Tension in the mind signals the body to tense every muscle. The reason for this is because the mind does not yet know what muscles will actually be needed, and to what extent, in order to survive the threat. If the perceived Stressor is a real threat, then this excess tension is Necessary Tension. Tension in the mind also signals the body to release adrenaline and cortisol in order to assist the horse in being able to kick or bite harder, run faster, jump higher, and so on. Please note, however, that while the Stressor IS tangible and DOES exist, it is only a Stressor for the horse who perceives it as a threat. One horse may have a Stress Reaction to something that another horse does not have a Stress Reaction to. The byproducts of a Stress Reaction (excess tension in the mind and body, adrenaline and cortisol) are also quite tangible and real. The damage they do to the mind and body is quite tangible and real as well. If the perceived threat turns out to be a real threat, the damage that is done by these byproducts is worth it. They help to save the horse from bodily harm or death, and since true threats do not occur often, the body has plenty of time to repair the damage caused by these byproducts. Since our domesticated horses do not live in the dangerous wilds, the problem for our horses is not true threats. The problem is perceived Stressors that occur on a pretty regular basis for most domesticated horses. Their bodies and minds are being damaged regularly by unnecessary excess tension, adrenaline, and cortisol with little time in between to repair the damage. Because the Stressor is not a true threat, the excess tension that is created in the horse’s mind and body is Unnecessary Tension. Most horse owners are unaware of just how much Unnecessary Tension their horses are holding in their minds and bodies on a regular basis. Some of the Stressors that a domesticated horse can be exposed to are injuries, colic and other illnesses, living in a noisy, busy environment, confinement and lack of enough proper turnout, saddle discomfort, training techniques that cause discomfort, a rider who causes discomfort, being transported in a trailer, being moved to a new location, separation anxiety, improper trimming and/or shoeing, lack of proper dentistry, being asked to work at a level that is beyond the horse’s conditioning, being mounted before musculature is warmed up and joints are lubricated, a difficult birth, castration and other surgeries, and more. Adrenaline and cortisol are being released into the horse’s body whenever the horse has a Stress Reaction. Adrenaline increases heart rate, elevates blood pressure and boosts energy supplies. Cortisol increases sugars (glucose) in the bloodstream and enhances the brain’s use of glucose. Cortisol also curbs functions that would be nonessential or detrimental in a fight-or-flight situation. It alters immune system responses and suppresses the digestive system, the reproductive system and growth processes. I think it’s obvious how damaging cortisol and adrenaline can be when released into the body on a regular basis. But what about excess tension? Let’s begin with tension in the mind. When the mind becomes tense, the rational thinking portion of the brain becomes restricted and the instinctive, reactive portion comes to the forefront. The reason for this is obvious. When faced with danger, the horse must instantly react to the situation. There is no time for the horse to think, only time to act. So in this situation tension in the mind is a good thing. It is Necessary Tension. However, when we are interacting with, and educating the horse, we want her focus on us and what we are asking of her, and we want her to be as much in the thinking portion of her brain as possible. In this situation tension in the mind is not a good thing. It is Unnecessary Tension, and to one extent or another it will interfere with the horse’s ability to focus on her handler or rider and/or the task at hand, her ability to learn new things, her ability to stay calm, and her ability to control her instinctive reactions, such as spooking, bucking, kicking, etc. As already stated, Necessary Tension in the body is the amount of tension required for a muscle to do its job. This is a constantly changing dynamic as the horse moves. In other words, the tension only exists when necessary and is immediately released when not necessary. Unnecessary Tension on the other hand tends to be in a chronic holding pattern. Chronic tension can cause a number of health and soundness issues. Tension causes constriction, and constriction causes restriction. Restriction reduces oxygen, blood flow and the removal of toxins. Restriction reduces oxygen in two ways. First, it reduces oxygen intake by causing shallow breathing, irregular breathing, and holding of the breath. Second, it causes decreased circulation which reduces the amount of oxygen that actually reaches the cells and reduces the removal of toxins. All functions of the body are regulated by oxygen. It must be replaced every moment because 90% of our lives depends on it. Oxygen energizes cells so they can regenerate. The body uses oxygen to metabolize food and to eliminate toxins and waste through oxidation. The brain needs oxygen each second to process information. All of the organs need a great deal of oxygen to function efficiently. The ability to think, feel, move eat, sleep and even talk all depend on energy generated from oxygen. Since Necessary Tension is immediately released when no longer needed, it does not interfere with breathing. In addition this tension, release, tension, release action of Necessary Tension actually increases circulation by creating a pumping action similar to the manner in which the heart pumps blood. Unnecessary Tension, however, tends to be in a holding pattern, and constant tension does restrict breathing and circulation, which will result in impaired health. Unnecessary Tension also impairs flexibility. Not only does this negatively affect performance, but it also puts the horse at greater risk of injury. Unnecessary Tension in the muscles is the biggest cause of skeletal misalignments. Skeletal misalignments are the biggest cause of most joint problems and other soundness issues. Unnecessary Tension is wasted energy. This means that the horse’s body is working harder to achieve the same results. 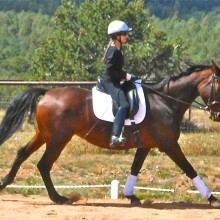 The horse in the photo is holding Unnecessary Tension in her mind and body as she canters. The longer Unnecessary Tension exists, the more it negatively affects the horse’s health and soundness. In my next article I will talk about the benefits of assisting the horse in releasing Unnecessary Tension and replacing it with Total Relaxation.